There were about 8 of us who met up at the Southwark Needle to cycle to Hyde Park and Notting Hill. Werner Wiethege took us on an interesting route through central London to Hyde Park and along a newly built segregated cycle route at Westbourne Terrace (CS3, see http://content.tfl.gov.uk/east-west-cs-overview-map-18-12-17.pdf). We were taken through some fascinating narrow streets in Chelsea and stopped off at the Design Museum for coffee. 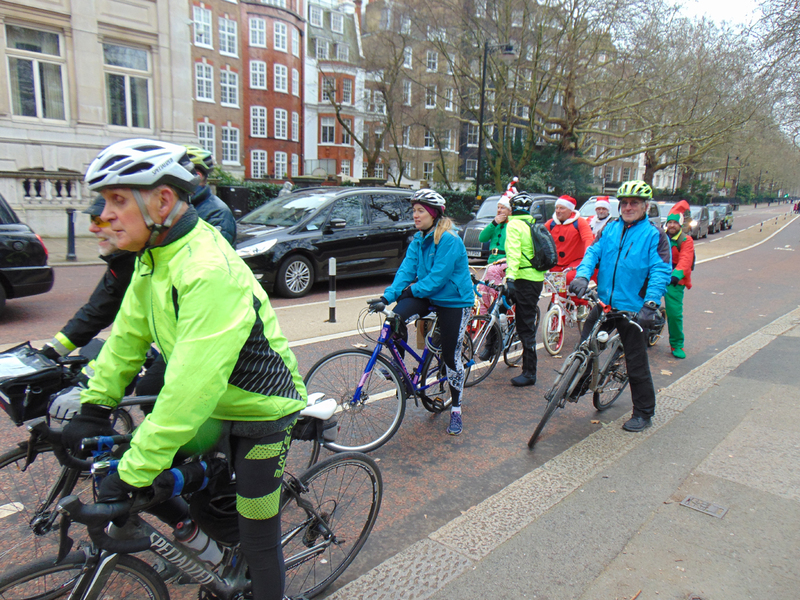 On the way back we were met by large numbers of Santas who had braved the weather to cycle around Hyde park. We stopped off at Parliament Square to look at the statue of Millicent Garrett Fawcett (https://www.theguardian.com/commentisfree/2018/apr/24/the-guardian-view-...). Our numbers gradually dwindled to four as people peeled off on the way back, and there were then just four of us who finished at the Southwark Needle.